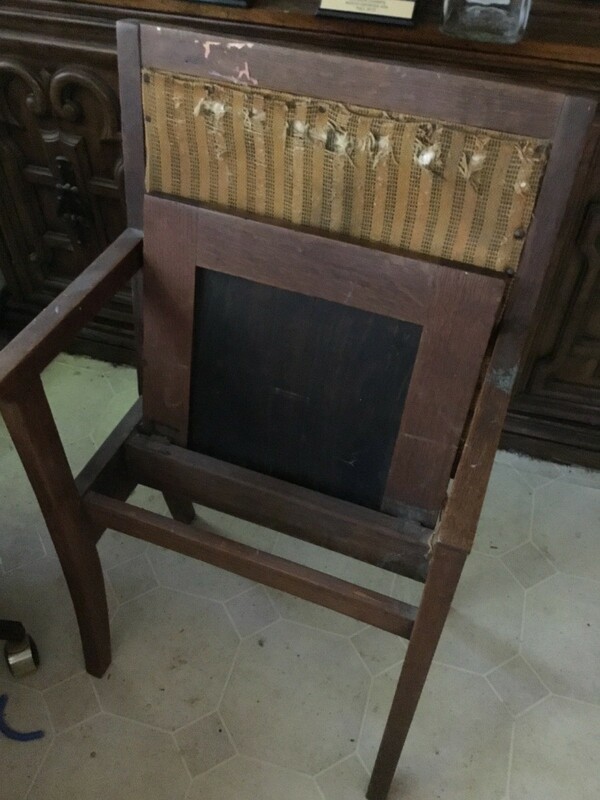 I was told in the early 80s this theater chair was very old and valuable. I can't find anything remotely similar. This is doweled together. Upholstery is original with brass tacks. The seat flips up. Hinges still working. Help? Very unusual but impossible to find a "sold" item such as this and that is what we would need to help you find a value. It's possible it came out of a famous theater or maybe a private theater. It is possible that whoever told you it was valuable knew something that we do not know and apparently did not give you enough information to help with research. This is the type of piece that requires the knowledge of an expert so I would suggest you seek help with a free appraisal as they will know more about this type of item. Here is a link that has some free appraisal sites but you should ask at several just in case there is no answer due to no one available that has knowledge about theater seats. 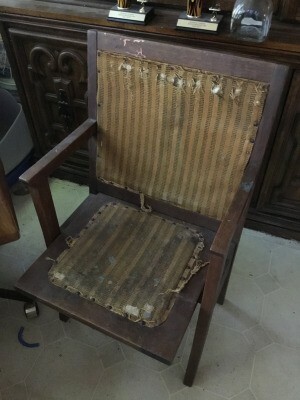 You should have several photos showing all side and describe the chair including the fabric. Here is a link to Barneby's but they charge $17 for their appraisal but it is usually well worth the price. This is a neat piece!! You most likely will not find an exact match on it as there are too many variables. If you knew specifically where it came from and the year, you may have a better chance of locating a like item on eBay or one of the other large furniture/collectible auction sites. Does it have any markings on it with the name or manufacturer number? Also, knowing where it came from does help in the value as it gives it the history...a chair from a famous NY theater for example will most likely garner more at auction than one from some small town outside of Pittsburgh that no one knows. Condition is also everything...and yours appears to be in rough shape. My concern (because I have seen this happen) is it was probably in great shape when you had someone value it for you in the 1980s, but now age has taken a toll, and probably money from the price. Do you just have the one piece? Sometimes that lowers the value as people like to buy these in sets....like when they tore town our beloved stadium and arena...people wanted multiple seats and those have held the value over a single seat. For pieces like this, it is best to take it to a reputable antique dealer and get an idea of insurance value. That is always higher than selling value, but it will give you a start. Please let me know what you learn! I am always interested in learning more about pieces like this! Thanks! Thank you for your response. I received this as a gift from a woman in Enterprise Alabama. She had lived in Pace Florida in the 50s. There are no markings, the only damage is to the Upholstery. It appears to be oak. Very solid, no nails,only dowels, other than the hinges on the seat which are intact.